5 Reasons To Get Kids Cooking! For many families the thought of letting their kids into the kitchen comes with many dangers – hot stoves, sharp knives, and the risk of a big mess. But getting children into the kitchen is a fantastic way to familiarize them with new foods, improve their self-confidence, build their fine motor skills, and of course teach them a fundamental life skill! There are tasks in the kitchen to suit every age and ability, from washing vegetables for dinner, to cutting out cookies and even making their own mini pizzas. The key to encouraging your buddy-ing chef is to start slow with simple quick recipes and most importantly making it a fun experience for everyone. 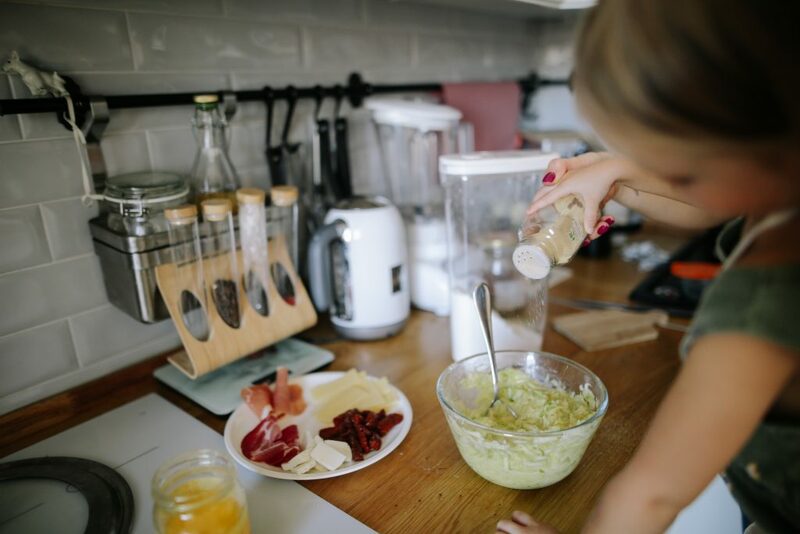 Here are our top 5 reasons to get your kids involved in the kitchen. All children are picky eaters who love something one week and hate it the next! But involving them in the preparation and cooking of meals will allow them to slowly recognize new foods and over time they will be more open to trying them when served at mealtime. Encourage your child to touch, smell, and feel the foods your preparing – yes that’s right you should encourage them to play with their food! If they have helped washed and peeled the carrot before they’re chopped up and thrown into your spaghetti bolognese your children will be less likely to pick it out and push it to the side of their plate. Most of the time children are hesitant to try new foods simply because they don’t know what it is! There’s no greater joy then making a batch of fresh cookies from scratch and sharing them with your friends and family. Encouraging your child to share their new skills and success in the kitchen will do wonders for their confidence and give them their own sense of accomplishment. The key to building their confidence is to start slowly with tasks they can manage and gradually increase their responsibilities. When starting out in the kitchen you might have your child mix the cookie dough and cut out their favorite shapes, then over time as they become more confident and can start measuring out the ingredients themselves. If you’re having trouble getting them in the kitchen to start, trying watching videos online of other children cooking so they can see others having fun and will know what to expect before you start cooking. Buying them their own baking set is another great way to encourage them to take pride in their cooking, and be sure to offer encouragement, praise and gently direction as you’re cooking together. Children with special needs are often faced with low muscle tone and poor fine motor skills, which will take small and consistent tasks to improve. Getting them involved in the kitchen is a great way of slowly teaching them problem-solving skills, concentration, patience, and hand eye coordination. Something as simple as rolling out pizza dough can over time help their muscle tone, while scooping flour out of a container and pouring into a bowl is great way to improve hand eye coordination. Cooking a meal from start to finish is always a great way to teach concentration and patience as the child must wait for everything to be cooked (and cleaned!) before they enjoy their meal. Don’t forget to involve other members of the family in the cooking to also encourage teamwork and communication! Over time these little tasks will build up the basic skills to needed to conquer bigger tasks outside the kitchen. Be sure to use visuals and simple instructions to help them follow a recipe. Recipes cards like these are a great tool and will slowly introduce them to key words and phrases. Let them identify on the cards what they’ll need for the recipe and then encourage them to count out the ingredients – 3 eggs, 1 cup of milk etc. Overtime they will be more confident as they are able to measure out ingredients and understand clearly written instructions. This is one of the simplest yet greatest reasons to invite your child into the kitchen. Creating something new in the kitchen can be messy, creative, and bring lots of laughs and smiles. It’s a fantastic way to spend one on one time with your child and encourage family bonding with siblings. Be sure to keep it fun by putting on some upbeat music, throwing on a bright silly apron, and of course enjoying the finished product together. At Real Community Services we understand it can be difficult for busy parents to be able to spend as much time cooking in the kitchen with their kids as much as they would like and that’s where support from one of our care givers can help. This is a great way for a care giver or support worker to bond and interact with their client and to help them achieve a greater sense of achievement and confidence. If you’re excited to get your child into the kitchen check out some of our favourite recipes that are quick, easy, and perfect for children with special needs.